Moffat County High School's Brock Hartung, left, and Drake Doherty close in to put the pressure on Pagosa Springs' Cade Cowan. 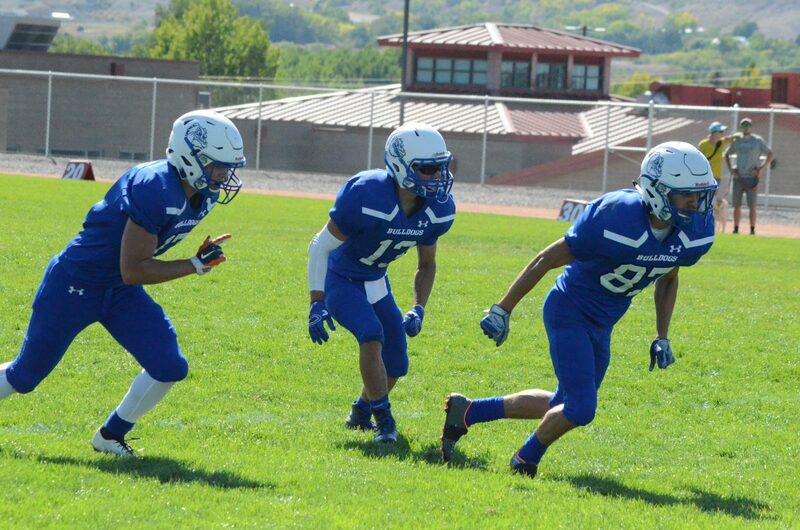 From left, Moffat County High School's Cale Scranton, Victor Silva and Dario Alexander line up in trips formation. 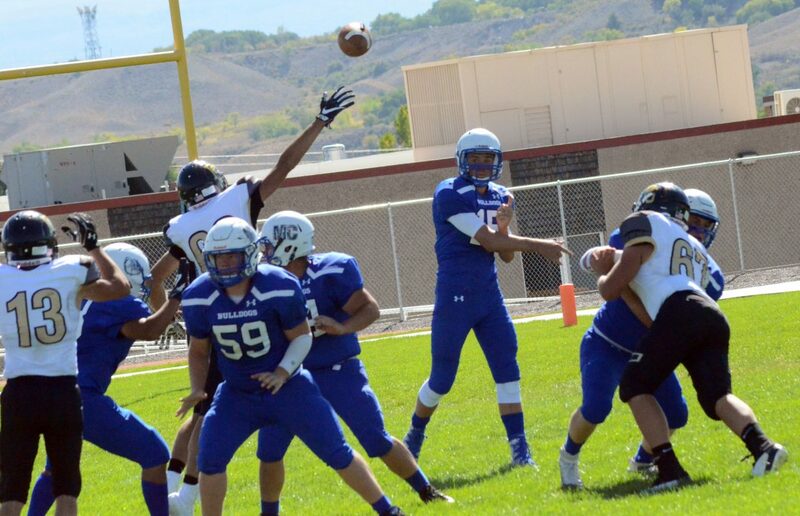 Moffat County High School's Colby Beaver fires off a pass. 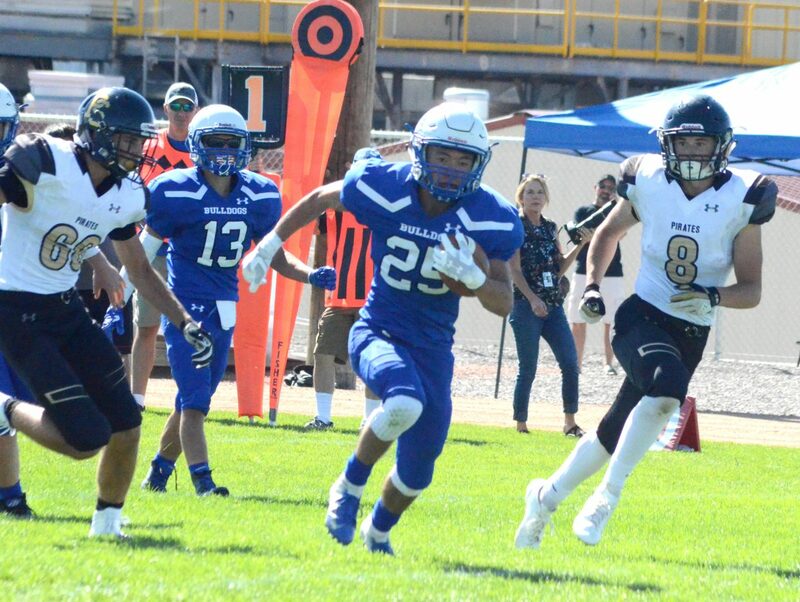 Moffat County High School's Dario Alexander takes off on a kick return. Moffat County High School's Kevin Hernandez stays a few steps ahead of Pagosa Springs' Mitch Lewis. Moffat County High School's Josh Teeter bursts loose to get to the goal line against Pagosa Springs. 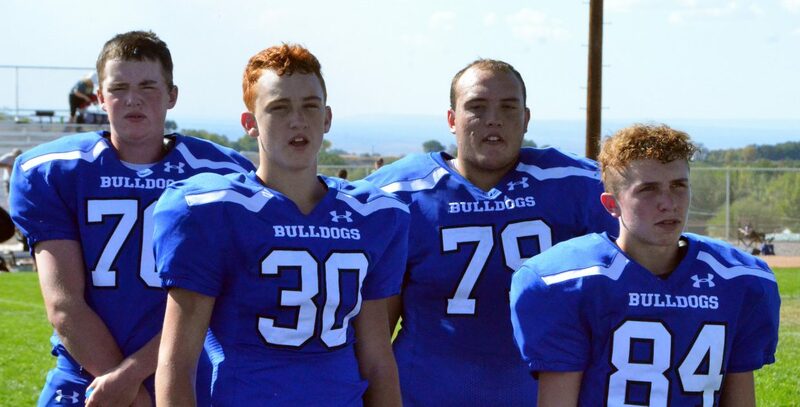 From left, Moffat County High School football players Joseph Winters, Brock Hartung, Bryson Davis and Dagan White recite the team motto following a defeat to Pagosa Springs. 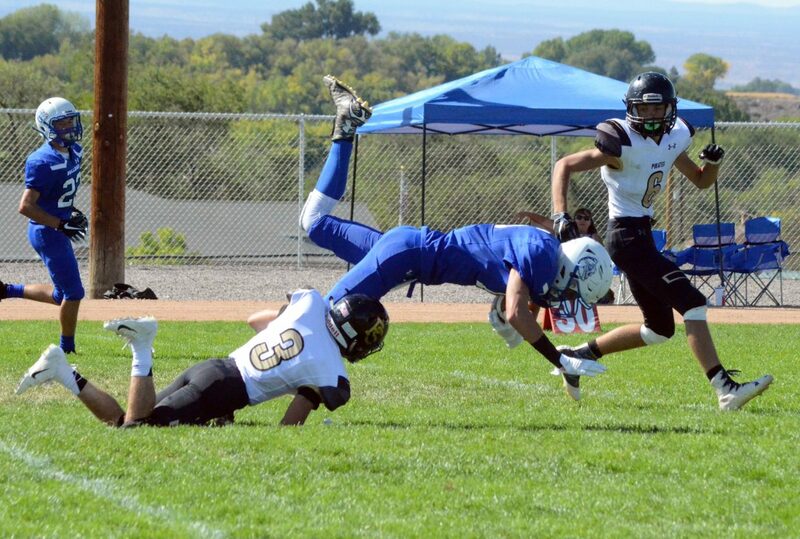 Moffat County High School's Kameron Baker is tripped up but stretches for the first down. Moffat County High School's Cale Scranton steps around the Pagosa Springs pass coverage for a touchdown. 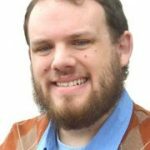 OLATHE — Hot sun, an unfamiliar field, and an opponent aching for a win after a shutout loss the previous week. 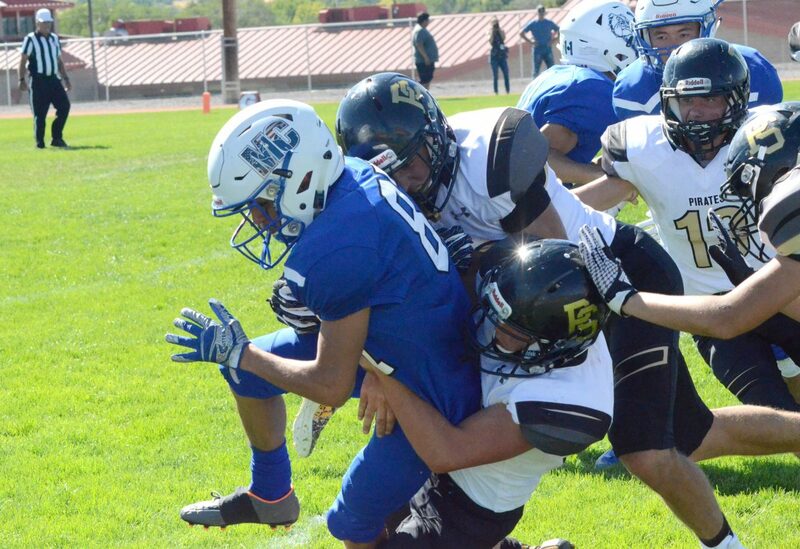 Moffat County High School football had a great deal working against them Saturday afternoon for their final non-conference game, and though it could’ve gone a lot worse, the results were still pretty painful. 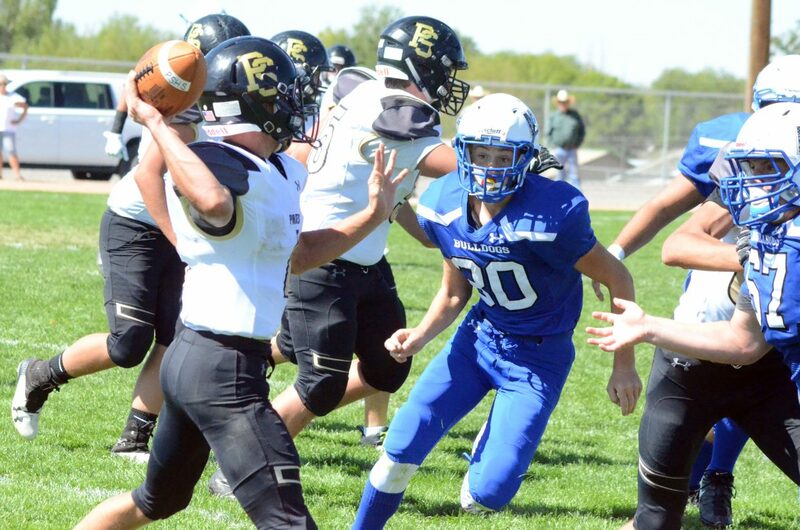 Bulldogs took their second straight road loss with a 49-20 defeat to Pagosa Springs, a game that took place on the home turf of a different Pirate crew. 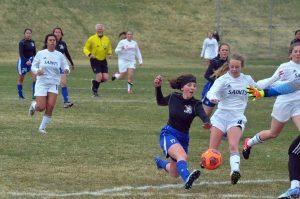 Due to cancellations for both teams — Ridge View Academy for MCHS and Gunnison for Pagosa — the two found themselves matched up and meeting midway between their long distance apart in Olathe. Now 2-3, Pagosa had only a 31-12 win over Centuari to their names and most recently took a 31-0 beatdown by Basalt, which contributed to their RPI ranking as the 2A team with the strongest schedule thus far. The Pirates showed they were no slouches with a strong opening drive capped off by a one-yard touchdown to get the lead with only 64 seconds off the clock. Pagosa was right back in the end zone a few minutes end later, with a Bulldog deflection on the PAT making it 13-7. A 15-yard catch by Kameron Baker got the offense revved up on the next drive, which ended with Cale Scranton snagging a 10-yard grab deep in the end zone from Colby Beaver to get the Dogs on the board. After sitting out for a week, Scranton said he felt confident getting back on the field, though he was strictly playing offense. “Shoulder’s feeling a lot better,” he said. With a successful kick by Joahan Quezada, the six-point difference late in the first quarter was as close as it would get during a long day. The Bulldog defense brought the hurt on Pagosa’s next possession, getting the Pirates in a tricky position at 4th down and 25 to go. But, a decision to go for it paid off greatly, as Cade Cowan whipped it to Lewis, who made a leaping catch with two yards to the goal line, which Paden Bailey crossed on the next play and Connor Aragon repeated for the two-point conversion to push the lead to 21-7. A Bulldog fumble gave it back to Pagosa, and it wasn’t long before a reverse to Aragon got another TD from more than 30 yards. MCHS coach Jamie Nelson noted that the Pirates’ option strategy in the backfield kept the Dogs guessing. 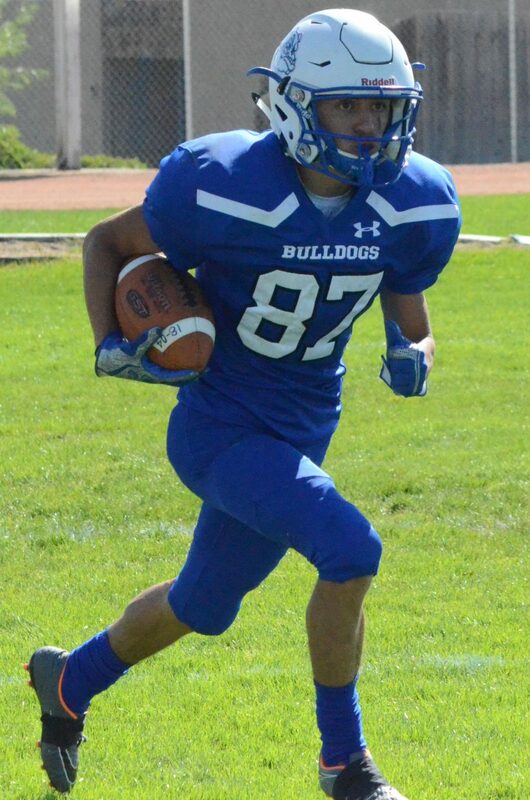 With a 28-7 tally hanging over their heads, Moffat County came out of the locker room with a new resolve, and following a determined kickoff return by Kevin Hernandez, the Bulldogs bulldozed their way down the field, with Scranton scoring another TD catch, this time from 15. 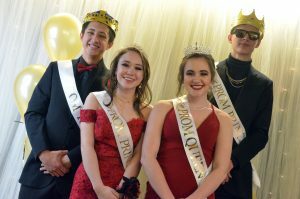 Pagosa went three-and-out and punted, MCHS did the same and held the Pirates on a crucial four downs as Cowan’s passes just weren’t connecting. But, what Pagosa couldn’t get done on offense, they did on defense as Bailey gained an interception on the very next play. Though neither side made much of the remaining third quarter, Cowan scrambled for a 15-yard touchdown early in the fourth to make it 34-14 for the Pirates, while Nelson told his players to keep the clock going slowly. Lengthy receptions by Baker and Josh Teeter were punctuated by a Pagosa penalty after Victor Silva was subjected to a late hit following an incomplete pass. Once at the goal, Beaver snuck his way in for the Dogs’ final score, with the PAT going wide. The Dogs suffered a loss to the roster late in the game when a tackle went awry for Kameron Baker, pulled off the field with a possible dislocated shoulder. Still, the Pirates weren’t done and took advantage of a weary defense with a catch by Bailey that turned into a 54-yard TD, followed by another scoring grab by Javier Marinelarena, who went all the way from midfield with Bulldog pass coverage caught off-guard. 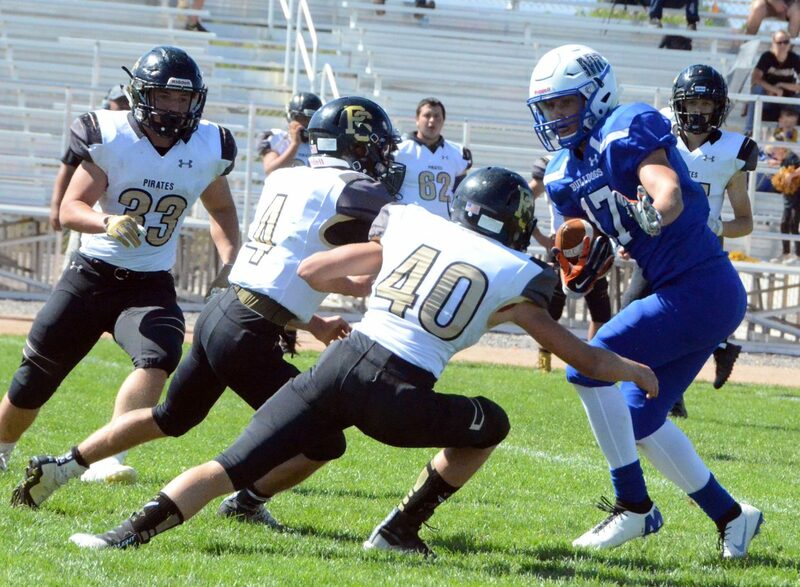 Statistically, it wasn’t a bad day for the Moffat County offense, despite the struggles to make it count. Beaver threw 161 yards and was 14 for 24 with one pick, while Scranton’s 63 receiving were complemented by 22 rushing while taking snaps. Hernandez’s 44 yards came from eight carries, and Teeter caught for 27 and ran for 13. Three catches by Kameron Baker amounted to 41 yards, with 21 for Silva and nine for Alexander. Pagosa favored sending the ball out of bounds on kicks, though Alexander had 47 and Hernandez 45 in return yardage, with 11 for Teeter. Defensively, Teeter and Jared Baker each earned a sack against the Pirates, as well as an assist for Beaver being mixed into the secondary. Teeter led the count in tackles with 18 total, nine solo. Drake Doherty was next with nine and Bryson Davis in for seven. 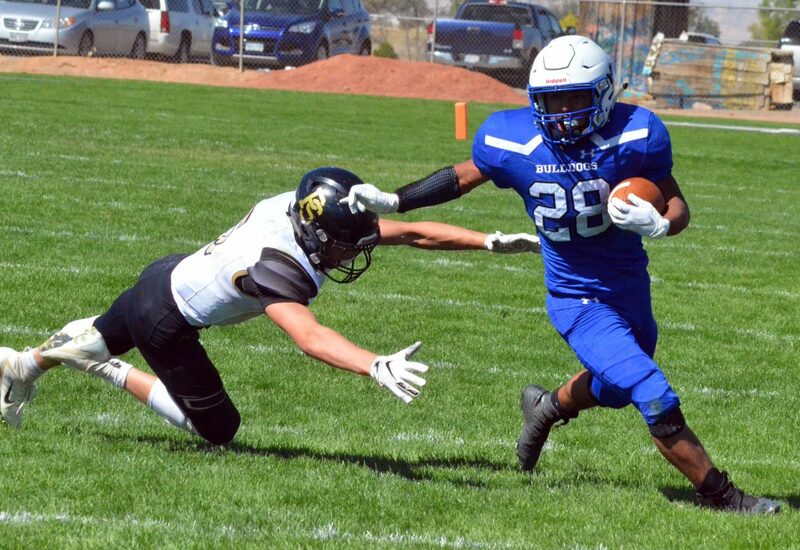 The loss puts Moffat County at 2-2 heading into the 2A Western Slope League schedule, which they will start at 1 p.m. Sept. 29 against Basalt for Bulldog Homecoming. 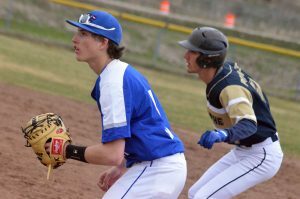 The Longhorns remained undefeated with a 16-0 win over Paonia, one of five Friday evening games for 2A WSL teams. Basalt and Rifle are each 4-0, with the Bears taking a 27-14 win over rival Glenwood Springs. At 3-1 so far, striving for third are Delta — who tiptoed past Bennett 7-6 — and Aspen, celebrating a 54-16 triumph over Grand Valley. Meanwhile, Coal Ridge stays at 1-3 after taking a 34-20 defeat on Olathe’s field the night before the Bulldogs. The Titans will host Rifle Sept. 28, with Aspen visiting the Panthers the same night. 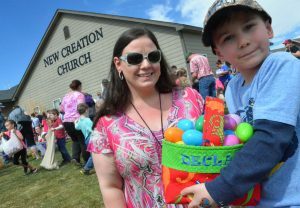 A second consecutive afternoon game means dealing with warm conditions once again, though Nelson said midday games are barely a step up in temperature from after-school practices and summer sessions. 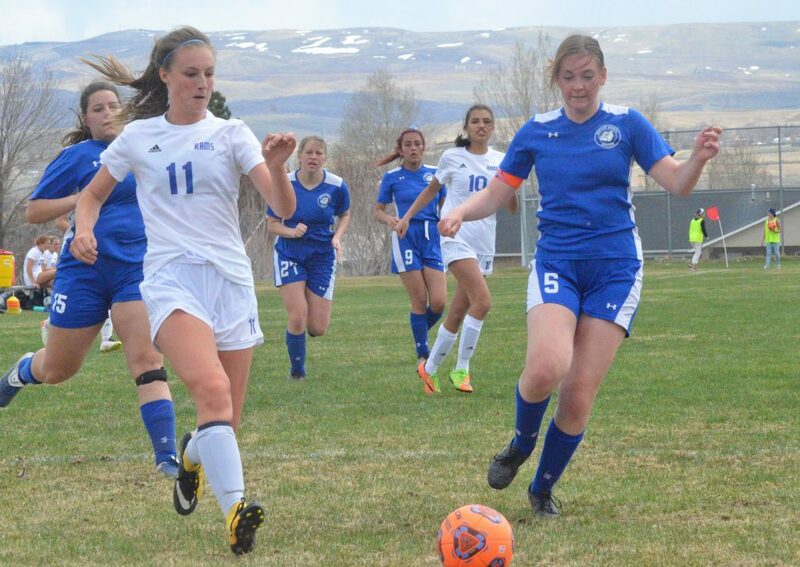 Besting Basalt, the two-time, defending champs of the 2A WSL, will be a tall order, yet Bulldogs are up to the challenge to put the rest of the conference on alert. “We just need to not get sidetracked and keep on track at practice, focus on the game,” Alexander said. The way Scranton sees it is the next level is a clean slate to get past any previous mistakes and press forward into the league. “Everybody’s 0-0 right now,” he said.